Yusuf al-Qaradawi. 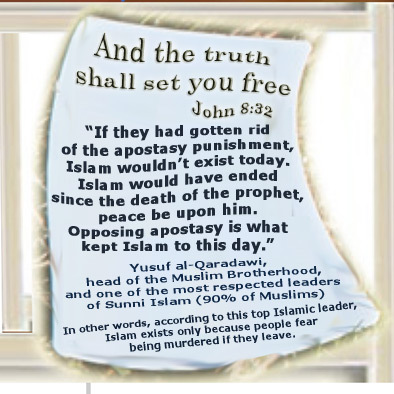 Death to apostates is needed to keep Islam alive. These are Islamic beliefs supported by many Islamic holy books. Facebook post. Death to apostates is needed to keep Islam alive. These are Islamic beliefs supported by many Islamic holy books. A piece of information came into my inbox. That's nothing extraordinary. Lot of info comes in. But this led to something extraordinary for me. I made a couple of images to help get the information out, posted the images on Facebook, and expected maybe 100 views. Instead the post went the tiniest bit viral - over 27,000 views for one image in a couple of days, about 3000 views for a second, and about 1600 views for the third. Why did this image, this information, touch such a responsive nerve? The information is a bit stunning - a top Muslim scholar acknowledged what non-Muslim scholars have been saying over and over for as long as they've been exploring Islam: there are many passages in Islamic religious texts that call for death for apostasy (leaving Islam). 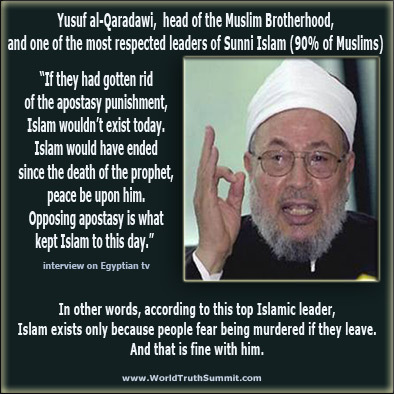 There's more: al-Qaradawi, the major Sunni scholar in question and head of the Muslim brotherhood, calmly asserted that the punishment for apostasy needs to be death, or Islam would have ceased to exist when Mohammed died. The information on the punishment for leaving Islam is as old as Islam itself. But al-Qaradawi made his very different assertions openly on national Egyptian television. When I think of it, maybe the most surprising thing is that the post got only 40,000 views, instead of millions. If you haven't looked at the post, please do. Click on any of the images. If you like what you see, please click the Like button. If you're comfortable putting it on your own Facebook page, click the Share button. All the best for all of us who truly believe in freedom - freedom of religion, freedom of speech, freedom of thought. 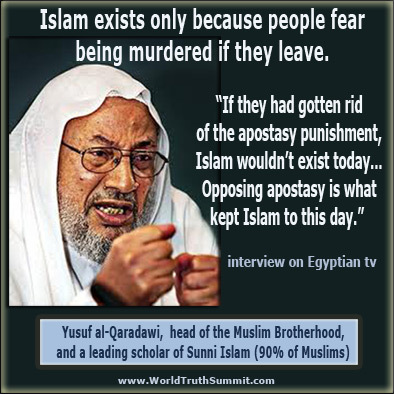 Death to apostates is needed to keep Islam alive. These are Islamic beliefs supported by many Islamic holy books.